Master Sgt. 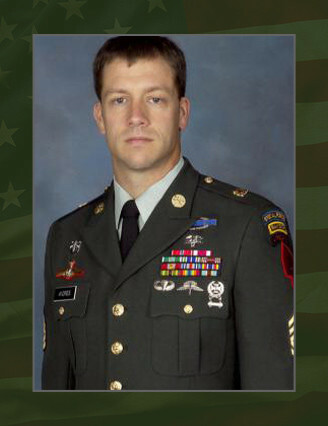 Joseph J. Andres, Jr., 34, a special operations team member assigned to Headquarters and Headquarters Company, U.S. Army Special Operations Command, Fort Bragg, N.C., was killed in action on Dec. 24, 2005, while conducting combat operations in Iraq. A native of Garfield Heights, Ohio, Andres graduated from Padua Franciscan High School in Parma, Ohio, and enlisted in the Army Reserve as a combat medic on Feb. 18, 1992. On April 21, 1993, he volunteered for active duty service and was assigned as a combat medic to the 42nd Medical Company, 68th Medical Group, Wiesbaden, Germany. He later served as a medical noncommissioned officer in A Company, William Beaumont Army Medical Center, Fort Bliss, Texas, and as a Special Forces communications noncommissioned officer in A Company, 3rd Battalion, 1st Special Forces Group, Fort Lewis, Wash.
His military training includes the U.S. Army Airborne Course, the U.S. Army Ranger Course, the Military Freefall Course, the Advanced Noncommissioned Officer Course, the Static Line Jumpmaster Course and the Basic Noncommissioned Officer Course. Andres’ awards and decorations include the Bronze Star Medal, the Meritorious Service Medal, the Army Commendation Medal, the Army Achievement Medal, the Army Good Conduct Medal (3), the National Defense Service Medal with bronze service star, the Iraq Campaign Medal, the Global War on Terrorism Expeditionary and Service Medals, the Noncommissioned Officer Professional Development Ribbon with numeral three, the Army Service Ribbon, the Overseas Service Ribbon, the Combat Infantryman Badge, the Expert Infantryman Badge, the Expert Field Medic Badge, the Parachutist Badge, the Military Freefall Parachutist Badge, the Ranger Tab, the Special Forces Tab and the Driver and Mechanics Badge. He was posthumously promoted to the rank of master sergeant and awarded the Bronze Star Medal for valor and the Purple Heart. Andres is survived by his parents, Joseph and Sandra Andres, of Seven Hills, Ohio.